From booking travel arrangements to packing, a lot of preparation goes into planning a vacation/holiday visit. One thing many people overlook, though, is preparing their home for what may happen after they leave. When you go out of town, especially for an extended period of time, ensuring your home is safe from possible intruders or other incidents should be a priority. Aside from checking that all of your doors and windows are locked, there are many other precautions you can take to protect your home. Here are some tips to help keep your home safe while you’re away. Give a set of keys to a trusted friend or relative in case of an emergency. If you have any spare keys outside under a flower pot, door mat, or any other hiding spot, move them inside while you’re away. When you advertise your vacation on social media, your home becomes a target. You may think there is no need to worry since you are just sharing the information with friends. However, your friends are not the only ones that can see your posts on social media. Posts can reach friends of friends or even complete strangers if you do not have the proper privacy settings. These people may not be so trustworthy. Save the sharing until you are back from vacation. A home that is noticeably dark for multiple days is a clue that you and/or your family are on vacation. Give the illusion that someone is home by putting lamps and radios on programmable timers. Since you have already given someone spare keys in case of emergency, have the same friend come over to check on your home frequently while you are away. Ask them to check for signs of home or property damage or signs of a break-in. Have them care for any pets that are still in the home. Request that they bring in the mail if you do not suspend your mail service. By having someone maintain a presence at your home, it will help give the appearance that you are home. Setting your thermostat at a lower temperature during the winter, or a higher temperature during the summer can significantly reduce your heating and cooling costs while you are away. You can even use this trick while you are at work every day to save money on your monthly energy bill! If you have a security system, post signs outside to signify your home is protected. 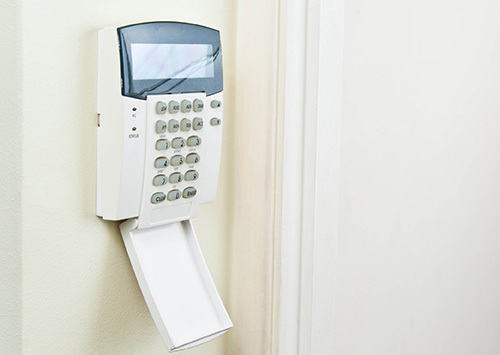 Burglars are less likely to approach a home if they know there is a risk of setting off an alarm. Hide valuable items in a safe place. Be cautious about using a small safe; it could be a target if it is small enough for the thief to walk off with. Consider getting a safe deposit box at your bank to store your valuables. Reduce the chances of an electrical fire by turning off and unplugging non-essential electronics. Many electronics will still use energy even if they are turned off. Therefore, you will also save money on energy costs by unplugging your electronics. If you have windows in your garage, invest in some curtains to cover them. If someone can clearly see there is a missing car or two from the garage, it could increase the chances of a break-in. Parking an extra car in your driveway lets people know that someone is home. Whether they think it is just a visitor or the resident’s car, if there is one parked out in the driveway, it can be a red flag for a burglar. You should spend your vacation/holiday relaxing and enjoying time with your family, not stressing out about your home security. Give yourself peace of mind while you’re away by taking these precautions before you leave.